A persistent 999 hoax caller was sentenced after pleading guilty to breaching the conditions of his Criminal Behaviour Order (CBO) when he appeared at Guildford Crown Court on Monday (25 February). Jeffrey Birnie, 66, of Freelands Road, Cobham, was given a 15 month sentence, suspended for 18 months, after he called 999 from his home address on 31 August 2018, claiming he needed urgent medical attention from paramedics. When two South East Coast Ambulance (SECAmb) paramedics turned up at his address, he was threatening and verbally abusive towards them. Birnie is prohibited from making 999 calls when there is a not a genuine emergency, as well as from using threatening or abusive language during a call or face to face contact with emergency staff, under the conditions of his CBO, which was granted by Staines Magistrates’ Court on 25 April 2017. Following the incident on 31 August, he was also charged with possession of a firearm with intent to cause fear of violence under Section 16A of the Firearms Act, but this charge was later dropped. 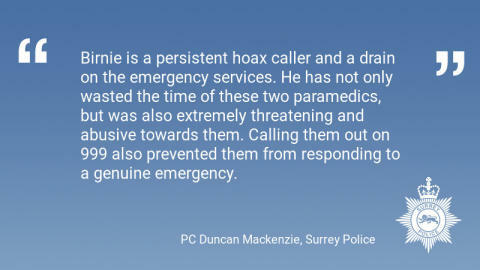 PC Duncan Mackenzie, who investigated the incident, said: “Birnie was given a CBO because he is a persistent hoax caller who is a drain on the emergency services, particularly South East Coast Ambulance Service and Surrey Police. The fact that he has breached the conditions of his order, and not only wasted the time of these two paramedics but was also extremely threatening and abusive towards them, is unacceptable. Calling them out on 999 also prevented them from responding to a genuine emergency.